By Clifford Pugh - The bidding was frenzied during a whirlwind live art auction that brought in $1.3 million for the Museum of Fine Arts, Houston's Latin American Art Department and its research institute, the International Center for the Arts of the Americas. 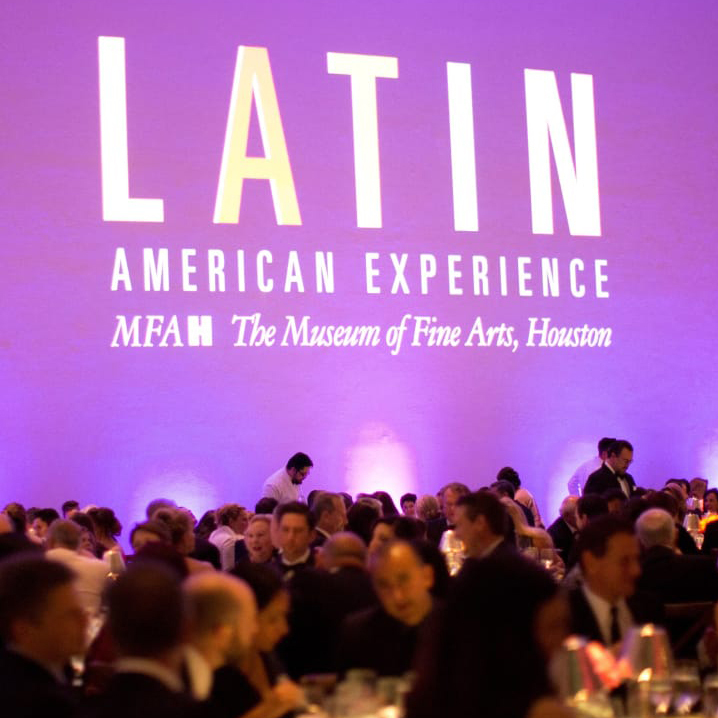 The museum's Brown Auditorium was filled to capacity with black-tie guests from Houston and around the world who competed to purchase 23 works by noted Latin artists. Phillips deputy chairman of the Americas August Uribe kept the bidding moving with grace and humor. "You have deep pockets. I hope to empty them tonight," he said at the start of the auction. At another point he said, "I'll hang it for you," to one indecisive bidder for a painting by Puerto Rican artist Tony Bechara that ultimately sold for $60,000. The auction was only one component of a series of lectures, gallery visits, private collection tours, cocktail parties, and special events called The Latin American Experience Weekend that had the MFAH in the center of art activity, drawing more than 150 international art collectors, gallery owners, artists, and art aficionados to Houston. The weekend began with a kickoff celebration and continued the next night with the opening of Adiós Utopia: Dreams and Deceptions in Cuban Art Since 1950. Guests previewed the exhibit, which is the "first, the largest, the most comprehensive, and, naturally, the best exhibition on Cuba art to be held in our country since 1959," MFAH director Gary Tinterow told the crowd. "We are very, very proud to be host of this magnificent and compelling exhibition." Tinterow saluted Miami art scene queen Ella Fontanals-Cisneros, whose passion for the Cuban project stretches back for years. "She's the greatest supporter of Cuban art today," Tinterow said. After the exhibit leaves Houston in May, it will travel to the Walker Art Center in Minneapolis. A contingent of Minneapolis art lovers were on hand, including Walker Art Center board president Monica Nassif. Afterwards, guests gathered in the museum's Cullinan Hall for a buffet dinner of shrimp ceviche, tamales, Cuban pork sandwich sliders, boneless beef short ribs, Tarte de Santiago and assorted desserts, catered by City Kitchen, and dined casually at tables decorated with palm trees. The weekend culminated with the Latin American Experience Gala, which drew 440 black-tie guests for the live auction, dinner catered by City Kitchen, and entertainment by Grupo Kache that had the dance floor filled. It had the spirit of a major gala, with women dressed in eye-popping designer gowns that rivaled those of any of the top charity events in Houston. The gala and accompanying activities have been held every two years since 2005, but this has been by far the most successful, said Mari Carmen Ramirez, the Wortham Curator of Latin American Art at the MFAH. "Latin American art is very hot right now. And has been for a number of years. I think something got hold of people here and they're excited about it," she said. "It was a very choice selection of artists, well established artists as well as very good artists who are now being rediscovered and reassessed. So they're all really good choices for buyers." In all, $1.9 million was raised, including over $170,000 in proceeds from the silent auction and over $1.3 million from the live auction. Seen amid the large crowd were Leslie and Brad Bucher, Mary and Tom Lile, Tony and Vanessa Sanchez, Pat and Bridget Wade, Mike Loya and Cory Whitefield, Tony and Carla Maarraoui, Marilyn Oshman, Rusty and Joanna Wortham, Cecilia and Tomas Gunz, Pat Breen, Celina Hellmund and Gabriel Castello, Cecily E. Horton and Andrew Schneck, and Stephen and Betty Newton. Also enjoying the activities were Ignacio and Isabel Torras, Mary and Bernie Arocha, Lawrence Luhring, Ike and Chandos Dodson Epley, Aliyya Stude, Susan Dunwoody, Carlos Cruz Puga, Joanne Houck and Tim Singletary, María Inés Sicardi, Sofia Adrogué and Sten Gustafson, Kristy and Chris Bradshaw, Nidhika and Pershant Mehta, Anne Schlumberger; Marc Melcher, Barbara Gamson, Mary Cullen, Lan-Phuong Vu-Yu and Dr. Tse-Kuan Yu, and Randall Jamailand Victoria Goldstein.